We wouldn’t know for sure, but we hear tell that certain athletes, like runners, are interested in improving their performance by imbibing certain substances. Like sports drinks, with their sugars and electrolytes. But a new study suggests that the perfect athlete-enhancing food may be in an entirely different section of the supermarket: the produce section. 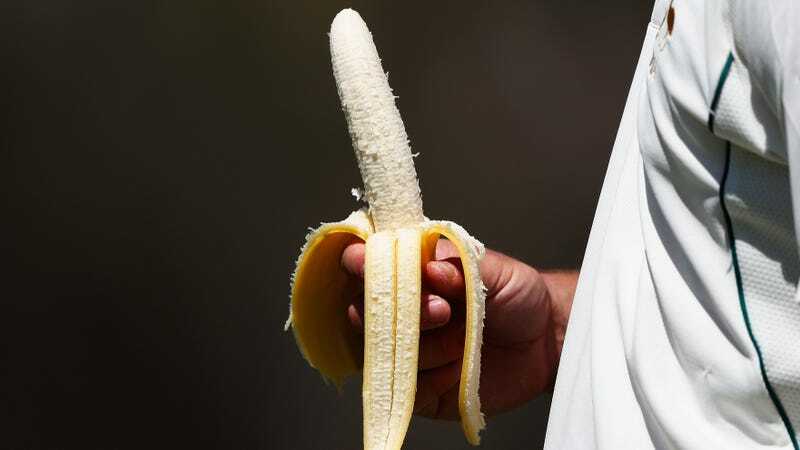 The New York Times reports today that “a new study comparing the cellular effects of carbohydrates consumed during sports… found that a banana, with its all-natural package, provides comparable or greater anti-inflammatory and other benefits for athletes than sports drinks.” But the news is not all good, says the NYT: “There may be a downside, and it involves bloating.” Well, that’s too bad. Still, the upsides appear considerable: While the athletes that consumed bananas or sports drinks both reported better performance than those who only drank water. And bananas provide actual solid food, obviously no artificial anything, and fewer sugars. The researchers at the North Carolina Research Campus of Appalachian State University in Kannapolis say that based on these results, they will explore these performance-enhancing benefits more on further study. In the meantime, instead of a sports drink, what about trying non-alcoholic beer before your next run?